It’s now May, which means it’s time for the release of our final Pokemon TCG expansion of the year. This year’s May set is Fates Collide, which appears to be a set aimed at giving a little bit of something to each type in the game. 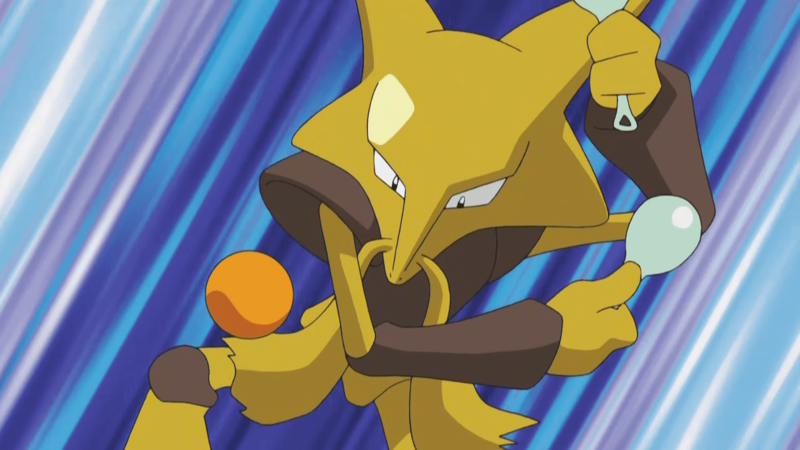 The most striking feature of the set is the return of Alakazam. This will actually be the first time in the five years that I have played the game that there will be a legal Alakazam card. Standard Legal Reprints – Cards that are already legal in the Standard format, that we already know how they interact with both the Standard and Expanded card pools and which need no further discussion. Busts – Cards which appear to be part of a failed design concept or are trap concepts meant to mislead players into playing cards that appear good but are actually not. Have Potential – Cards that could work in the right meta game, or if another card is released to unlock its potential. Tech Options – Cards that will never be major parts of a meta game, but are verifiable tech options players can use for some utility in their decks. Stars – Cards that are clearly good and should see play as an archetype, contributor to an archetype, or which are commonly splashed into decks. Superstars – The absolute best cards in the set that will be major players in multiple meta games throughout their lifetime. I won’t review every card in the set, as there are some filler cards not worth reviewing. I will simply stick to cards that players would have some reason to believe they could be played in some competitive setting. The most interesting aspect of these reprints is that Pokemon decided to reprint some of the type specific support they have printed in the XY bloc. 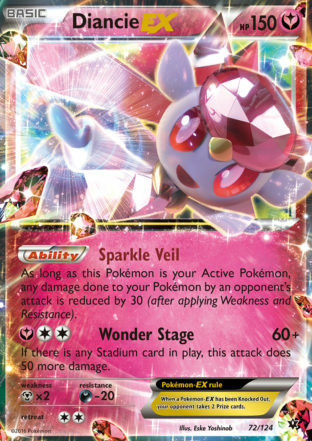 Most notable are the reprints of Fairy Garden and Strong Energy, allowing future Pokemon of those types to make use of cards that made up a large part of that type’s identity for the past two seasons. In this section I will cover cards that are busts. These are cards that are part of a design concept that won’t work in competitive play, either through being under-powered in their design or intentionally added into the set as a trap card that is meant to look good, but is actually not. Starting off this review I want to look at Mothim and Wormadam, primarily because did anyone actually know that these were real Pokemon? I had never heard of these Pokemon before seeing the Japanese set leak. The synergy of these cards appears to be using Mothim’s Ability to move damage counters to the Metal Wormadam to use its Strike Back attack, which does 20 damage times the number of damage counters on it, to take OHKO’s for a single Energy. 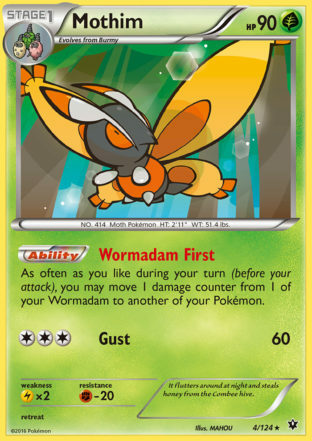 Of course there is no real synergy, as there will almost never be damage counters to move from a Wormadam to another Wormadam because they are all such low HP they will get knocked out by most Pokemon’s attacks. This card seems as if it can be very powerful at first glance, but there are too many factors working against this card to make it good. The first strike against the card is that it is a Stage 2, and those cards typically don’t work unless they have a strong Ability or a lower attack cost. Needing three Energy to attack will ultimately doom this card to being nothing more than a fun deck inclusion. You can use Blacksmith for acceleration, but it will be hard to use Blacksmith when you need to play your Supporter cards to get out a Stage 2. The BREAK is also an option for acceleration, but that’s only one Energy, and you not only need the Energy to power up its own attack, but also get some other Energy onto the field to power up the damage output. 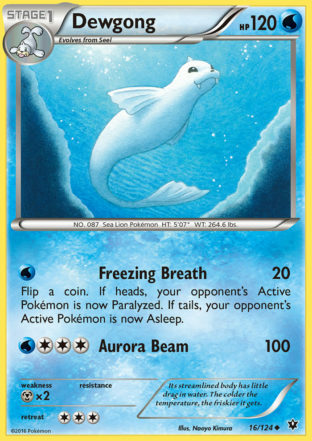 With Freezing Breath your opponent’s Pokemon will be Paralyzed 50% of the time and stay asleep 25% of the time, meaning 75% of the time your opponent won’t be able to do anything during their turn unless they play a counter (such as Zoroark BKT). The damage output is probably too low to make this card work. Lilligant EPO also only did 20 damage with its Bemusing Aroma attack, but that also Poisoned the opponent, and Confusion is actually a better fail Ability than Sleep. The reason for this is that both will be effective half of the time they come into play on your opponent, but Confusion has a drawback of 30 damage if they flip tails, while Sleep only gives them a wasted turn. The Poison was important because it could create situations where your opponent’s Pokemon would get knocked out going back into your turn. 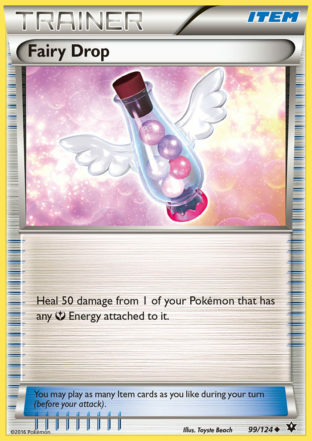 This could be replicated with Ariados AOR, but that’s adding another evolution line into the deck, and you would also have to deal with your Dewgong being Poisoned as well. Additionally, Victini NVI was legal in the format where Lilligant made Top 4 at Spring Regional Championships to increase the probabilities of flipping heads for Paralyze. 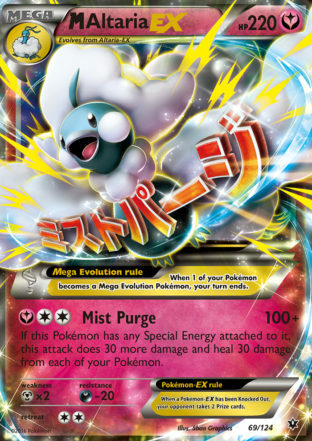 Trick Coin can replicate this role, but you would want to play Dewgong with Vileplume most likely, making Trick Coin awkward to play in the deck. 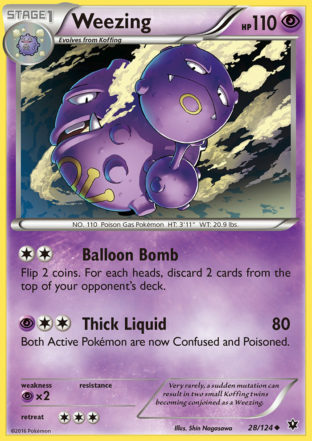 On first look, players might see a new mill deck in the works with Weezing’s Balloon Bomb attack, which can be fulfilled for a single Energy with Dimension Valley in play. Unfortunately, the math isn’t really in Weezing’s favor. The math on the card is simple, 25% of the time you mill 0 cards, 50% of the time 2 cards, and 25% of the time you will mill 4 cards for an average of 2 cards milled per a turn. That isn’t a strong enough mill to base a deck around, and if you want to mill 2 cards per a turn, Bunnelby PRC is a much simpler option. Trick Coin can be used to raise your average mill to 2.5 cards per a turn if my calculations are correct, but compared to Bunnelby, needing to evolve, play a Stadium, and attach a Tool all for an extra half card of mill is simply not worth it. 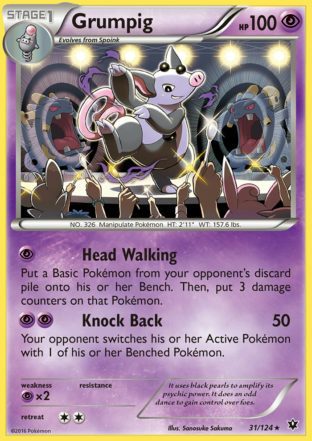 This was at one time hyped as a potential counter to Night March because it can put a Joltik from the opponent’s discard pile onto the bench and KO it for an easy prize. However, using a Stage 1 to trade 1 for 1 on prizes with a non-EX is a poor trade when you take into account the effort you needed to use to get a Grumpig in play compared to the effort they needed to get their Basic Pokemon in play. For a single Psychic Energy with Dimension Valley in play you can do 190 damage if you fulfill all of the conditions of the attack. To get this maximum damage output you need to not prize any Solosis, and have three different evolutions of a single Pokemon line in play while also having the Stage 2 evolution in the Active position. These requirements will rarely be met and are easily disrupted. Additionally you’re using a 90 HP card to do the damage that cards like Joltik and Vespiquen already do through much simpler means. These are some unfortunate cards taking up ultra rare spots in packs that players will have to suffer through when they open packs. These cards both are limited in their damage numbers, and don’t have any other good characteristics to make up for that. The 30 damage heal from M Altaria EX is neat, but there is only a narrow range of decks where that would actually come in handy. Low HP, medicore Ability, and a bad attack combine for one waste of an Ultra Rare spot. In most circumstances this card will max out its potential at around Tierno levels, but against evolution decks it will probably be worse than Tierno. 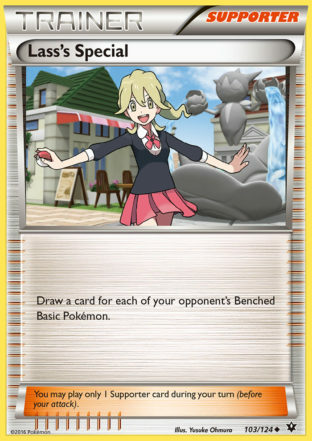 There are unlikely to be many scenarios where your opponent’s bench is loaded up with Basic Pokemon to allow for good draw from this card. There are very few scenarios where you would want to switch one of your opponent’s benched Mega Pokemon with their Active Pokemon. Typically you would want to bring up something like a Shaymin EX that is easy to knock out, and not a Mega Pokemon that is more difficult to knockout. 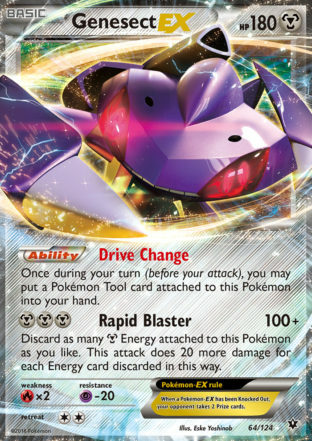 For at least the next year, Lysandre will also be in format giving a more universal gust option that players would play over this card. In this section I will look at cards that have the potential to be good, but are not clearly good cards yet. These are cards that may need future cards to be released to be made good or cards which can be good if the right meta game develops. 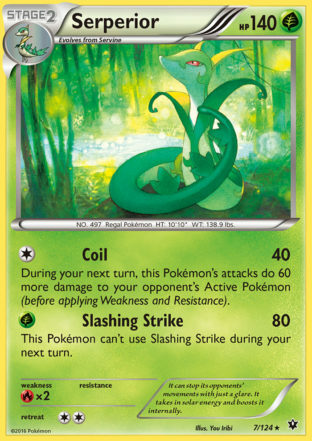 Serperior seems to be flying under the radar, but the potential seems to be there for a nice little Grass deck. It can be evolved into in one turn with Forest of Giant Plants, and then can do 80 for a single Energy. Coil is interesting as it can do 40, while setting up a 100 damage Coil or a 140 damage Slashing Strike the next turn, making this card very strong in getting 2HKO’s. Forest of Giant Plants – Can be evolved into in one turn. 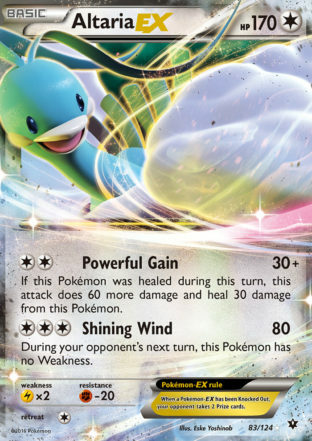 Revitalizer – If you have a Snivy in play and a Servine and Serperior in the discard pile, that means that playing Revitalizer gives you instant access to Serperior when FOGP is in play making it very easy to stream these. Servine – Stage 2’s with Stage 1’s with good Abilities or attacks help make theire Stage 2 being playable. Half the time when you evolve through a Servine, you will paralyze your opponent’s Active Pokemon which is a very strong effect. Attack Cost – A one Energy attack cost makes it easy to use once you evolve into one. Additionally, Greninja BREAK decks look like they will be in a very strong position if Battle Compressor rotates, and this provides a fairly hard counter to those decks. 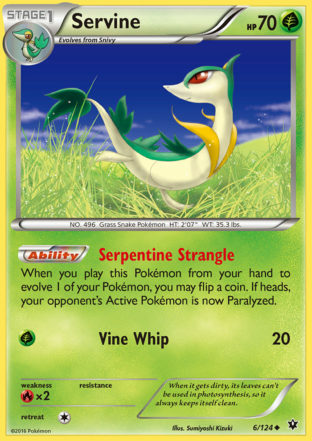 If Serperior gets a BREAK, this card will gain even more power. 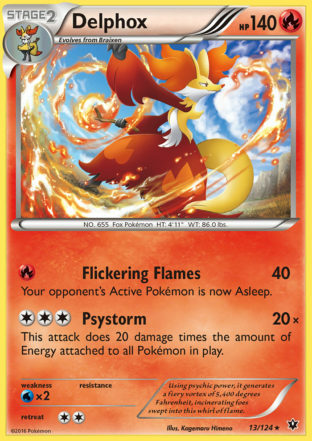 Delphox BREAK has some minor potential because of the strength of Delphox XY’s Mystical Fire Ability, which could make for some interesting deck builds that can gain Energy Acceleration from Delphox BREAK. However, that potential is very limited. 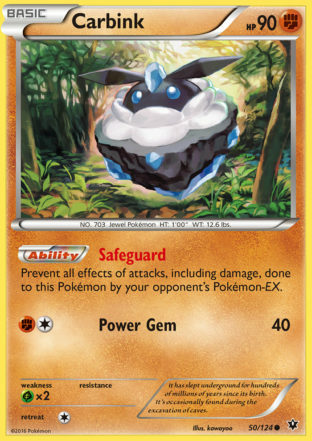 This is essentially a Stage 3 Pokemon, and a similar card, Chandelure PLF, never saw any real competitive play. Ultimately, I think this card is good in its own right, but it’s missing a proper Delphox to use as an attacker with it, and that is probably a necessary ingredient to a Delphox BREAK deck since it is essentially a Stage 3, which means you will have to devote a lot of deck space to it. 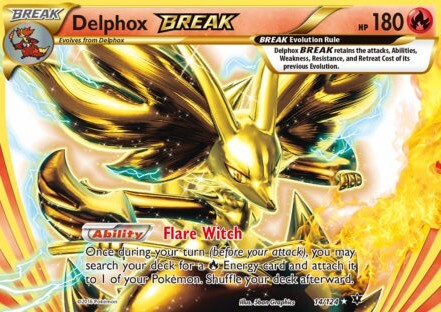 If we get a new Delphox with a more usable attack, then Delphox BREAK would be an obvious inclusion. For now, I don’t think there is a Delphox worth building a deck around. This is a card whose strength will be determined largely on what future Restored Pokemon are printed. If some really good Fossil Pokemon are printed, then it will have a purpose to fulfill. If Pokemon doesn’t print good Fossil cards, then it won’t be very good. Aerodactyl from this set actually has some potential as a Restored Pokemon that doesn’t have to evolve further. As its Water type, you can use Archie’s Ace in the Hole to put it into play making decks built around this more feasible. 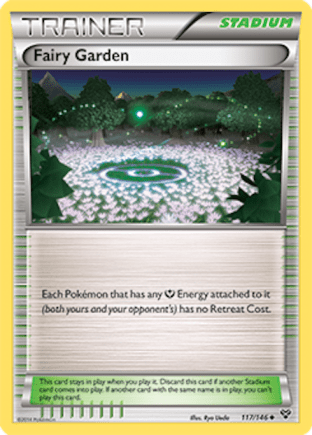 A guaranteed gust effect on EX’s can certainly be powerful, especially in a format where players are spamming their benches with Shaymin EX. 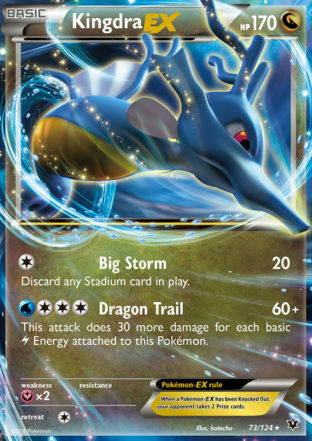 The card is probably too awkward to fit into decks, as you need to get Omastar into play and then evolve it, as you can’t directly use Archie’s to get out the BREAK because it’s not considered a full card. 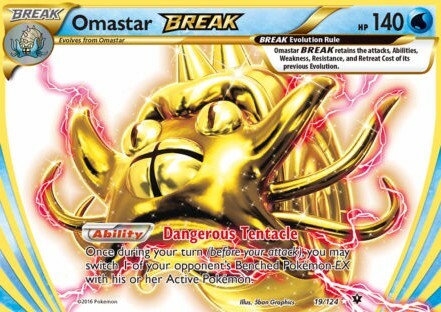 It’s definitely on the fringe, but a 1-1-1 Archie’s Omastar BREAK line could fit into a Battle Compressor deck like Night March or Vespiquen/Flareon. 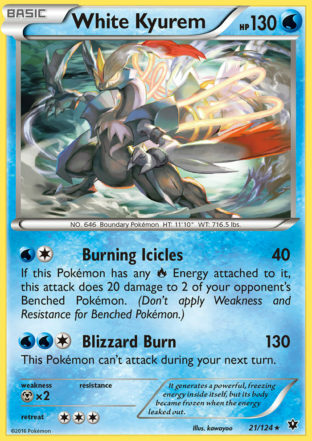 Some players are trying to see Kyurem PLF in this card, but the comparison should not be made. This card doesn’t have the support of Deoxys EX, Thundurus EX, and Colress Machine, and the 20 damage from Burning Icicles probably doesn’t built up to anything significant like a 30 damage snipe can. 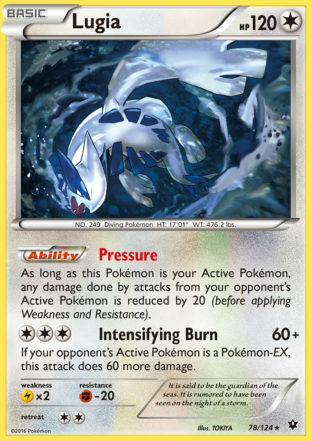 It is a non-EX Basic Water attacker that does hit the 130 damage mark, which could make it a niche inclusion in Archie’s Blastoise decks in Expanded format, but there’s probably no greater ambitions for this card than that. 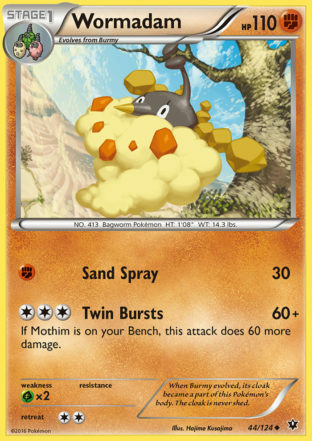 This has some potential to be an effective Trevenant BREAK counter. Plasmagic helps you protect the benched Pokemon that you’re trying to setup from getting wiped out by Silent Fear and effectively forces them to use Tree Slam to knockout Rotom before one Rotom does too much damage. Since it moves damage counters, it avoids being hit by Burst Balloon. 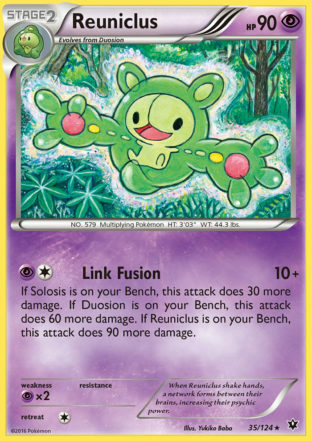 A neat attribute of this card is that if you had a full bench that got hit by Silent Fear, it can do 120 damage, enough to OHKO a Shaymin EX. 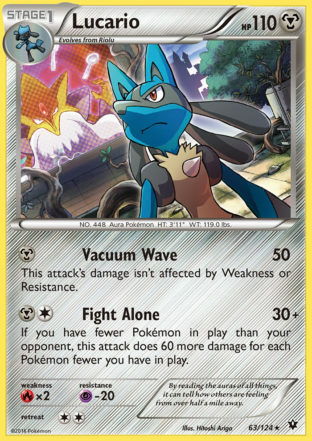 Lucario could be poised to take over as the non-EX OHKO deck of the format after Battle Compressor rotates out of the format. This type of attack would in most formats be too easy to play around, but there is a new Item card coming out in a future release, Captivating Pokepuff, which lets you put as many Pokemon as you like from your opponent’s hand onto their bench allowing you to build up your opponent’s bench. Target Whistle is also another option available until it rotates. The damage buildup is fairly strong, needing to keep a 1-2 bench difference against low HP decks, and a 3 bench difference against most higher HP Pokemon. You can actually hit for 170 with a Muscle Band and a 2 bench difference, which can take out a lot of EX Pokemon and all BREAK Pokemon. Muscle Band will probably rotate out however before it makes sense to play this card. The trickest thing to figure out with Lucario will be how to power these up, as it has a two Energy attack cost on Fight Alone. Using Max Elixir on Riolu or Exp. Share are potential options for a Lucario deck to use. There are two roles that Tyranitar could fulfill in Dark decks. 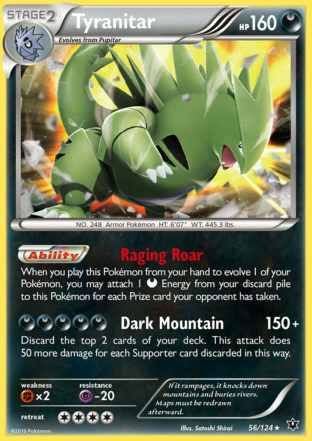 The first is to use Raging Roar to setup Dark Mountain in one turn, attach a Muscle Band, and use N and try to sweep with Tyranitar. The second role is as a late game damage boost for Darkrai EX BPT decks. Both of these seem like fringe uses, so the card will most likely flame out and not end up in competitive play. 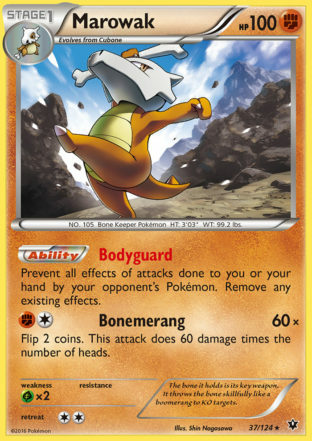 It’s not the type of card that you can build a deck around in it’s own right, and since it’s a Stage 2 who you want to time its evolution, it can be awkward to get at the right time, and if you have a Pupitar sitting on your bench waiting to evolve it, your opponent can Lysandre it to disrupt that strategy. Kingdra EX can make for a solid power hitting EX for Magnezone BKT decks. It forces you to play an off-Energy type, but it’s also a bit more Energy efficient of a big hitter than Raikou BKT is. Raikou needs 6 Energy to hit for 170, while Kingdra EX can hit for 180 damage for 5 Energy, which is not only more efficient, but a better damage number to hit. 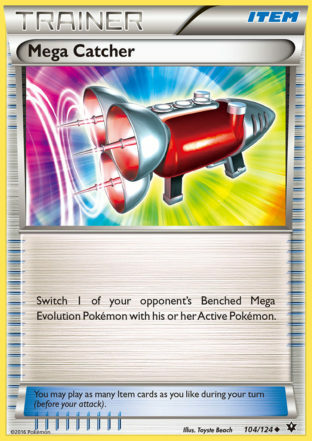 Whether the card is able to see play or not is almost entirely dependent on whether Magnezone BKT decks can become relevant in the formats after Battle Compressor rotates. Aerodactyl is a Restored Pokemon, which brings up some red flags, but all you need to do with Aerodactyl is get it into play, you don’t have to further evolve it to make it useful as you do with most Restored Pokemon. You can use Archie’s Ace in the Hole to put an Omastar into play and then get your Aerodactyl into play through that, or by using Fossil Excavation Kit to spam Old Amber Aerodactyl until you get Aerodactyl in play. It’s very difficult to tell what the best engine for the card would be. The Fossil Item cards follow the same probabilities as Great Ball, which are not quite great, but they’re okay, so if you were to spam enough of them you would be able to get some Aerodactyl into play. 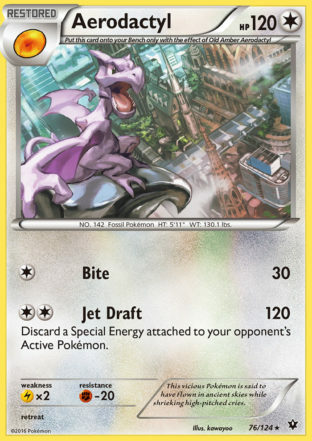 I think the probabilities are low enough to the point where you would have to build any such Fossil deck using Aerodactyl as an optional attacker and not a main attacker. 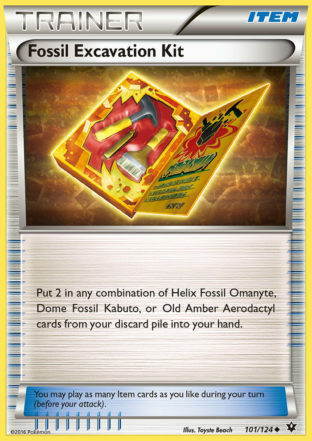 Fossil Excavation certainly helps as you can spam Old Amber Aerodactyl, but how much of your deck do you want to devote to trying to get a Pokemon into play? Nonetheless, 120 damage for two Energy while discarding a Special Energy card attached to the Defending Pokemon is a fairly strong attack on it’s own. 120 damage is especially an important damage figure because it reliability OHKO’s Shaymin EX, 2HKO’s EX’s, and is a good number for cleaning up damage after something like a Quaking Punch. In Expanded format, it can do 170 damage with a Muscle Band with LaserBank, all for two Energy which is very efficient. I could see this getting play with Hypno BPT. 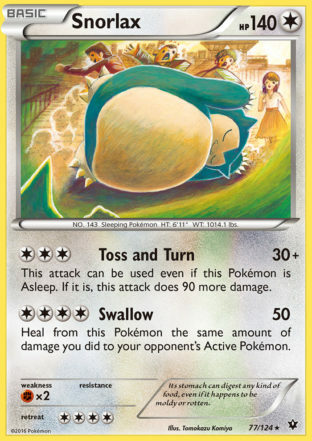 Since you can attack while Snorlax is Asleep you don’t have to worry about playing All Night Party to negate the effect like you had to in the Darkrai EX/Hypno deck that was floated around after BREAKpoint was released. This means you can use the Sleep effect from Hypno’s Ability to disrupt your opponent and not just as a means of boosting the attack damage. Magical Symphony is essentially Night Spear on steroids. You do have to play a Supporter card to trigger the bench snipe, but you generally will want to play a Supporter card during your turn anyhow. The 50 damage is a fairly nice number, allowing you to OHKO Pokemon such as Combee or Joltik, and it can build up into a KO on a Stage 1 such as Zoroark or Vespiquen with two attacks, or setup an EX for a KO over the course of two attacks. Not sure where this card fits into any prospective format, but it seems to be a solid all around card, and being Colorless type gives it lots of options of what it can be played with. I don’t think this card will make it’s way into competitive decks, but the potential is there if attacks with strong enough effects get released that gain popular play and need to be countered. 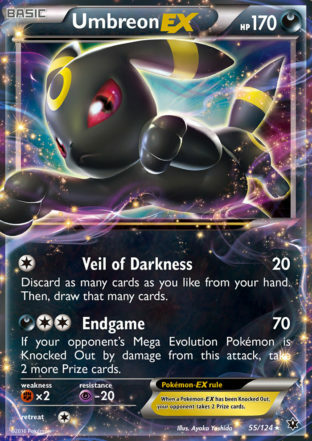 One niche role it could serve now is for a deck like Night March or Vespiquen to use against decks that try to use the Jirachi promo to discard their Energy. I am not really sure what to make of this card. It’s an interesting effect, but I’m not sure there is much to combo with it. It’s best use in the current formats is probably with Double Dragon and Double Colorless Energy, as those cards can setup a new Pokemon quicker. It can help you collect back on stray attachments from the early game, or to transition to a new attacker moving away from an attacker that would be knocked out if left active. With something like a Rain Dance Ability, you can use Energy Reset to pick up your Energy, use Max Potion, and then play your Energy cards back down. 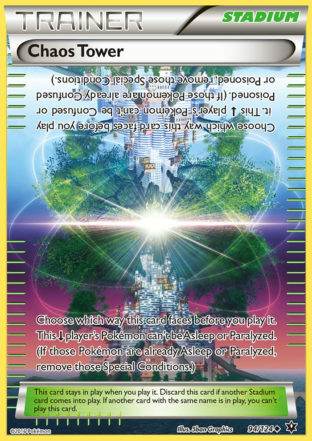 These types of Energy cards that have an effect when they come into play may be more valuable to return to your hand with Energy reset and these types of cards may be on the way to combo with thi scard. This card’s usefulness is dependent on there being a deck that uses Fairy or Rainbow Energy becoming good and the format being based around multi hit kncokouts and not OHKO’s. Random Receiver is an Expanded format reprint. The card has been good in various formats for different reasons. It was great in HGSS-DEX as it gave you a Supporter out with Junk Arm. It was good in BLW-on formats for being retrieved with Sableye DEX’s Junk Hunt attack or just to round out a draw engine early in the BLW-on era when there weren’t many good Supporter cards. This is probably a card to look more as a card with future potential. I don’t see it getting thrown into decks until Battle Compressor rotates at the least, but it would probably also take the rotation of VS Seeker before this card would start being put into decks. This gives a nice little boost to mill decks, giving them an additional means to mill their opponent’s deck beyond their attacks. It also could be a nice tech option for disruption. In the late game especially, when your opponent’s deck is getting thin, they may may have a few key resources they need to finish out a game. 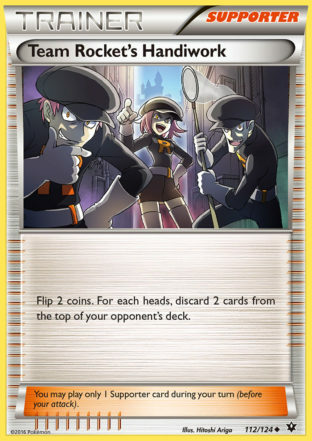 You can play Team Rocket’s Handiwork and potentially discard key resources from their deck. I don’t think it will be thrown in as a 1-of inclusion for the chance to deck people out. A decent amount of games in the past few formats have come down to players having only a couple cards in their deck on the final turns of the game, but even with that players aren’t already including Bunnelby as a 1-of for that purpose, so I doubt they would include this as a 1-of to fulfill that purpose. While the situation comes up a noticeable amount, it’s not a large enough quantity of games to devote a deck space to this purpose. In this section we will look at cards that can be described as solid tech inclusions for decks. These are cards that serve a clear purpose for what their role in the meta game is, but aren’t cards that are good enough to base a strategy around them. For this purpose, these cards usability is dependent on what cards other players are playing. As noted in our State Championship recap, Double Colorless Energy was played in 2/3 of decks. In addition to that, other Special Energy like Strong, Mystery, and Double Dragon saw play in decks. 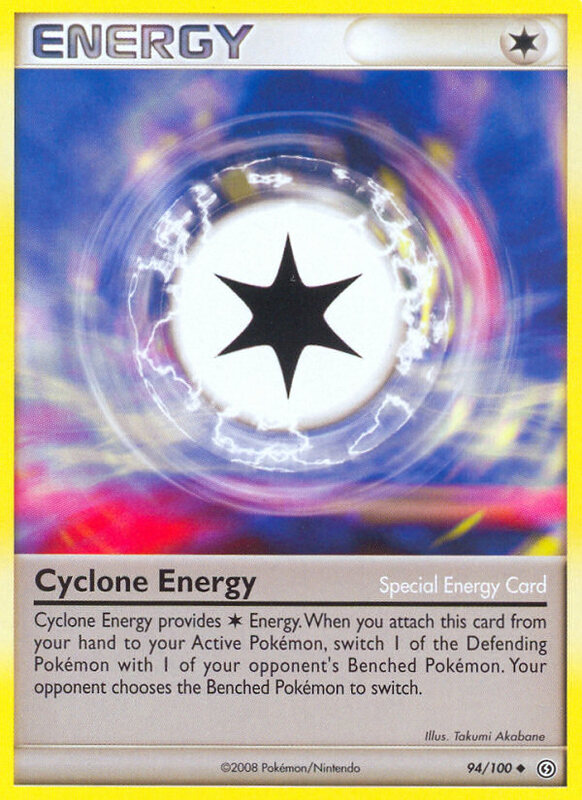 Clearly a card that can block a player from attaching Special Energy can play an important role in the meta game. The thing to know about this card is that it must be your Stadium Card in play for the Ability to be in effect. That means that your opponent can counter the Ability by playing their own Stadium. They can also disrupt it by playing Hex Maniac, but that means they’re not using another Supporter for their turn which can set them back if that was an otherwise sub optimal Supporter card. Some players are writing this card off too early because of this detail, but I think that’s foolish. This card still disrupts your opponent by forcing them to play a card to enact their strategy. If they don’t have a Stadium card, they can’t play Special Energy card, creating the potential for them to whiff attachments if they’re highly dependent on Special Energy. Not only does it create a situation where they need a counter card, it creates a situation where they need the counter card first before they can do anything. This can disrupt your opponent, even if they can hit a Stadium in their turn. For example, take a situation where your opponent is playing Night March and they have Double Colorless Energy, and Professor Sycamore in hand. Under normal circumstances they would attach the Double Colorless Energy and then play the Supporter. 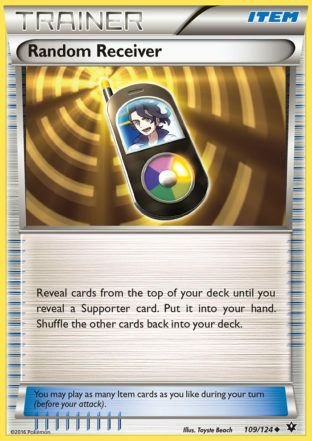 However, if they don’t top deck a Stadium, then their DCE is going to go to waste when they play Professor Sycamore. They need the Stadium first, which can force them into positions where they waste resources or have to do something like play an N to try to draw into the Stadium and an Energy. The card is very interesting in mirror matches, where players will typically be playing the same Stadium. This means that if Barbaracle becomes big, one player in the mirror could end up fighting at a major disadvantage for the entirety of the game if they didn’t get their Stadium into play first. This could force a Night March player, for example, to include Delinquent or Paint Roller in their deck to counter their opponent’s Stadium and play down their own if Barbacle becomes a popular inclusion in Night March decks. 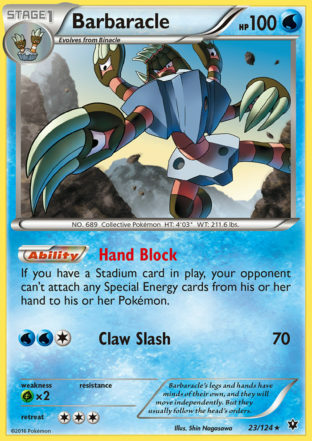 The card can also be highly disruptive against decks such as YZG which typically go very low on their Stadium counts. The long awaited Seismitoad EX counter has finally arrived, and it’s a pretty good one. You do need to either evolve into it or use Maxie’s to get it into play, but as a Stage 1 it won’t be very difficult to get into play. It also has a BREAK available to it, allowing you to get further use out of the card in Fighting decks. The card not only counters Seismitoad EX, but also Giratina EX. The game ended up tilting too hard towards strong disruption that could essentially make it so you couldn’t play much of a game, so it’s nice to see a hard counter to these cards be released. Apparently one Seismitoad EX wasn’t enough as we also get a counter card to Seismitoad EX/Hammers decks. Energy disruption has become too big of a portion of the meta game for the past two seasons, and games against such decks are typically not very fun, so it’s nice to see a counter to them. 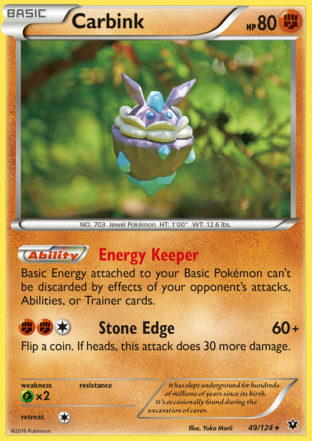 The card also can be used to change the dynamics of a matchup against something like Sableye/Garbodor, where you have the option to protect your Energy if you can keep Garbodor out of play. I do wish that it protected Energy from evolved Pokemon as well, but we will take what we can get. I’ve always felt that Dark decks can struggle against Mega decks in the Expanded format as Dark decks have difficulty trading well with M Rayquaza EX in particular. 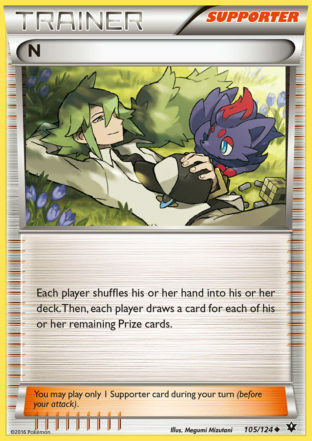 Umbreon EX completely changes the dynamic of the matchup in Expanded, allowing you to take four prizes when you knockout a M Rayquaza EX, making it so you only need to knockout a Shaymin EX to win the game. Veil of Darkness is also a decent attack to have for an early consistency out to avoid losing a game to dead drawing. 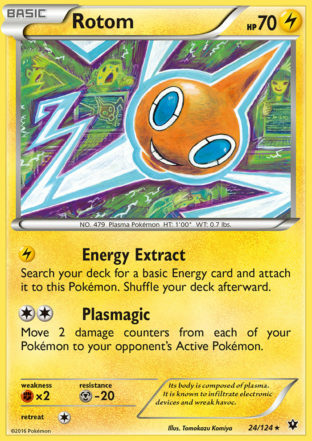 I don’t see this card being played as more of a 1-of in Dark decks or decks that can move Energy around, and it will only be played in meta games where Mega Pokemon make up a solid share of the meta. This is essentially a Stage 1 Mr. Mime that also prevents effects of attacks done to your Benched Pokemon. This of course means that Trevenant BREAK’s Silent Fear would do 0 damage to your Benched Pokemon, giving us a solid counter to Trevenant BREAK decks. Because of its Psychic resistance, it would take multiple turns to knockout giving you ample time to setup Pokemon to attack with while not taking any damage to those Pokemon. This sets dual Stadium card prevents various Status Conditions from being in effect depending on what side the card is facing. One side prevents Sleep and Paralysis, while the other side prevents Confusion and Poison. Both players can still be freely burned when this card is in play, except in Standard format because Chandelure EX was the last card printed that could burn an opponent’s Pokemon and that came back all the way back in Legendary Treasures. Status Conditions aren’t that big in Standard, but I could see this card seeing some play in Expanded to counter things like Accelgor DEX or Hypnotoxic Laser. In Standard, the card combos well in the Darkrai EX/Hypno BPT deck, giving the deck a stronger Stadium Card than All-Night Party. The issue with All-Night Party is that when you didn’t take a OHKO, it allowed your opponent to wake themselves up and heal their Pokemon. With Chaos Tower in there instead, you can actually use the Sleep Condition to try to disrupt your opponent from being able to attack. 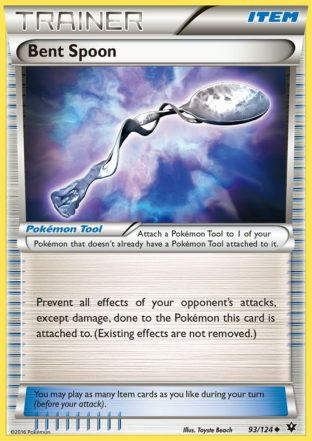 This could be a strong Pokemon Tool to include in Rain Dance deck, especially in Standard format where Superior Energy Retrieval has rotated out of the format. 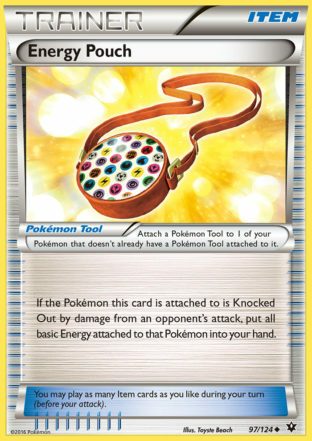 A Raikou BKT/Magnezone BKT deck for example can attach Energy Pouch to Raikou, and then when it’s knocked out, you get to put all Energy attached to the Raikou back into your hand, even if it’s a large amount like 10 Energy, giving you the Energy needed to power up your next attacker. These are the cards that are clearly good cards and should see play a role in either creating an archetype or strengthening an archetype and be part of competitive play at some stages of their lifespan. Glaceon EX is similar to Jolteon EX except that it prevents damage from Evolution Pokemon instead of Basic Pokemon. Jolteon EX seems to have worked out successfully at countering Basic Pokemon, so I would imagine Glaceon EX will be equally successful in countering Evolution Pokemon. 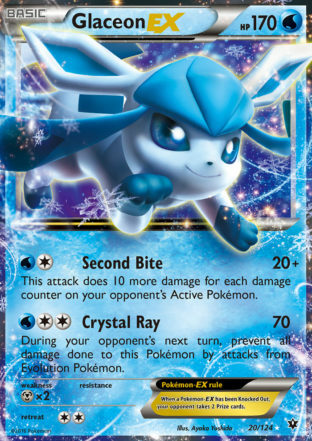 One thing to note is that Glaceon EX blocks damage from Evolution Pokemon, and not just Evolved Pokemon. 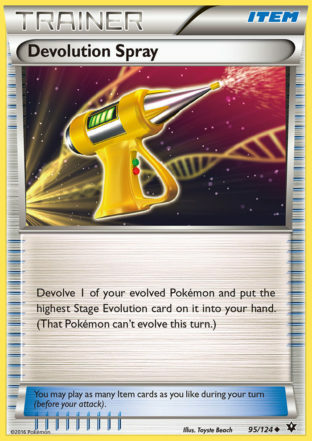 This means that it also blocks damage from evolution cards that were put into player through other means such as Archie’s and Maxie’s. I’ve gone back and forth on my opinion of these cards, but ultimately, I’ve decided that these cards will probably be good. Crobat decks were fairly strong at various points simply by being able to add around 130-150 non-attack damage during the course of most games. Alakazam EX should probably be able to to hit those numbers fairly easily. 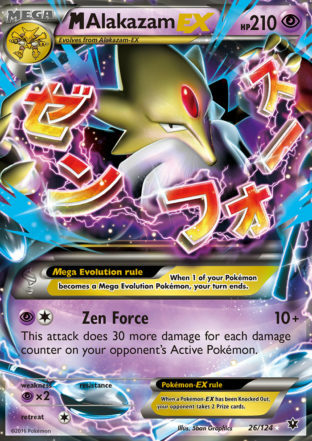 Evolving into 3 M Alakzam EX in a game already gets you to 150 non-attack damage, and then you can use Super Scoop Up or Devolution Spray (freshly reprinted) to gain more opportunities for non-attack damage. 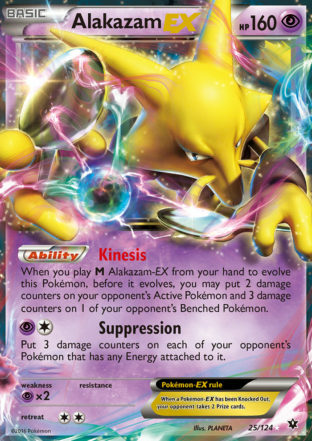 M Alakazam EX also can hit for some hard numbers, and can also attack for only a single Energy with Dimension Valley, which makes it easy to power up and can allow you to play Max Potion to heal it (although using Super Scoop Up and evolving into another M Alakazam EX to trigger another Kinesis Ability may be better). I would imagine a deck built around it would have some Night March problems in the upcoming format, but as soon as Battle Compressor rotates I think M Alakazam could do well in a future meta game. It’s Deoxys EX for Fighting Pokemon essentially. Fighting Pokemon can now hit some pretty crazy damage numbers all for a single Energy. 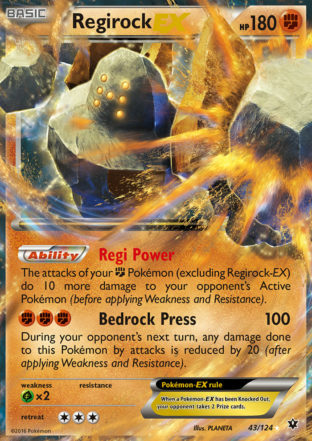 Regirock EX allows cards like Lucario EX or Landorus EX to move into the territory where their one Energy attacks are 2HKO’s, or OHKO’s on lower HP Pokemon. It doesn’t have a very useful attack and it has a high retreat cost, which makes it somewhat of a liability, but the damage numbers it allows you to hit for should more than make up for these downsides. Basic Safeguard Pokemon generally do well. The last two we received, Sigilyph and Suicune, both saw success in competitive play, so one would expect Carbink to do the same. 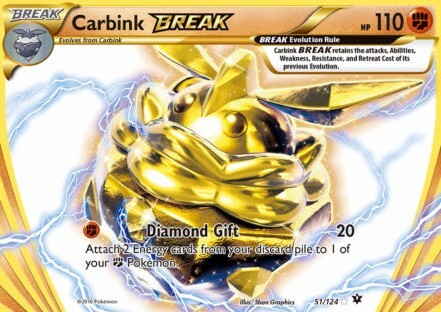 The format is very non-EX heavy right now, but that doesn’t mean it will always be that way, and as soon as it moves away from being so non-EX heavy then Carbink can play a role in the format. 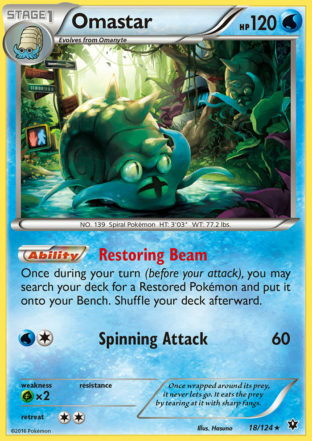 One interesting thing about this release is that Carbink gives one of the missing ingredients to rebuild most of Enrique Avila’s Wailord EX deck in the Standard format. When I tested Wailord EX before State Championships, the one major flaw I saw with the deck was the lack of Safeguard Pokemon with Suicune rotating out, and Carbink can fulfill that role. This will be an easy 1-of inclusion for Bronzong PHF decks. 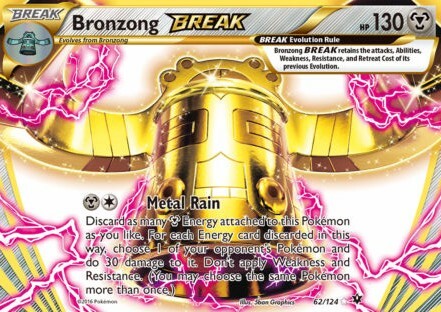 Metal Rain gives those Bronzong that sit on your bench all game an attack that is worthy of use, and it also gives Bronzong decks more versatility, allowing them to setup KO’s on future attacks, or cleaning up any narrowly missed KO’s. 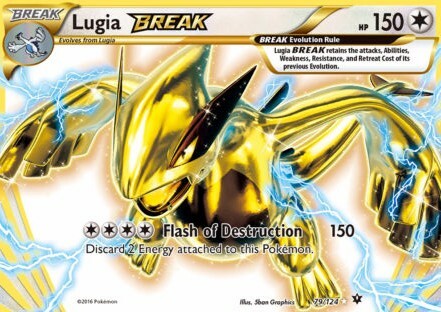 The attack is particularly strong against Night March decks, as you can take out multiple Night March Pokemon using 3-4 Energy attached to Bronzong BREAK to do so. 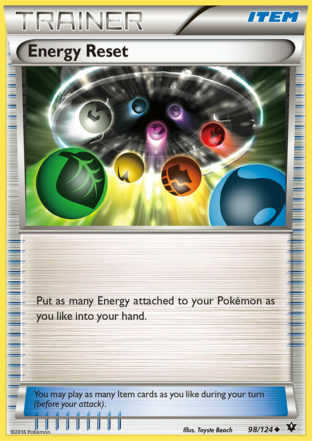 With 4 Energy attached to it, you can do 120 damage to one of your opponent’s Pokemon, which is good for letting you snipe Shaymin EX’s for knockouts. 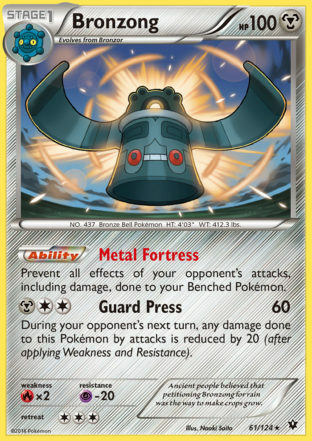 Genesect EX is the attacker that straight Metal decks have been looking for since Bronzong PHF was released. Rapid Blaster is an amazing attack, allowing Genesect EX to transition between a Pokemon that holds its Energy while it takes a knockout and a Pokemon that scored OHKO’s depending on the situation you find yourself in. Rapid Blaster will allow for simpler Metal builds, which should help in creating more consistent Metal decks. The Ability also amazing, letting you swap out something like a Muscle Band for a Float Stone when you want to retreat your Genesect EX to the bench for another one. I think the card creators put a lot of testing and thought into this Genesect EX and Bronzong BREAK to make Bronzong PHF decks more competitive, and when this level of thought goes into designing cards for an archetype, that archetype generally becomes good. Lugia is essentially a reprint of Bouffalant DRX with some minor changes. Lugia has 20 more HP, making it harder to knockout, but its Pressure Ability only reduces damage when Lugia is Active, while Bouffalant’s would do it from the bench, meaning that Lugia can be hit from snipe and spread attacks. Lugia will find its footing when (and if) we have a transition to a more EX dominated meta game. However, one thing to note is that most non-EX decks are heavily reliant on Shaymin EX draw engines and Lugia’s Intensifying Burn solidly OHKO’s it. The BREAK gives Lugia an HP boost, making it pretty bulky for what would essentially then be a Stage 1. The attack Flash of Destruction gives you the option to do heavier damage for a single Energy more than what you need for Intensifying Burn, potentially giving you a OHKO option if you have a Muscle Band attached to it. This card didn’t see much play during its last lifespan, primarily because de-evolving isn’t necessarily good when you can’t re-evolve instantly. 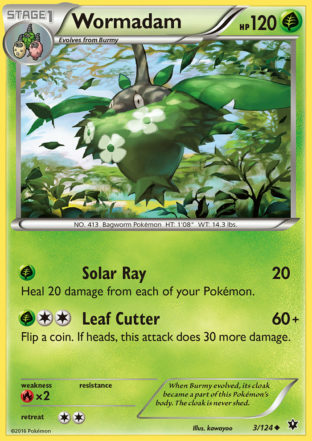 Forest of Giant Plants did allow for situations where Abilities that come into play when you evolve can be re-used instantly after de-evolving by re-evolving, and this led to the ban of Shiftry NXD because its Giant Fan Ability was too degenerate for the game. There are two Abilities in Standard format that could be made use of with FOGP and Devolution Spray. The first is Servine, which lets you flip a coin and Paralyze your opponent’s Active Pokemon if you flip heads. The second is Forretress FLF, which puts 10 damage when it comes into play. Decks with low HP starter Pokemon such as Night March, Trevenant, Vespiquen, and Greninja were fairly popular at State Championships so there may be room for a Latios EX/Foretress donk deck to see success in Standard format as we head towards the National Championship. The other obvious cards to try this with are Crobat PHF and M Alakazam EX. Carbink BREAK can be looked at as Landorus FFI on steroids. The card does 20 damage, just as Landorus does, but allows you to attach 2 Energy cards to a Fighting Pokemon, instead of a single Basic Energy to any Pokemon. 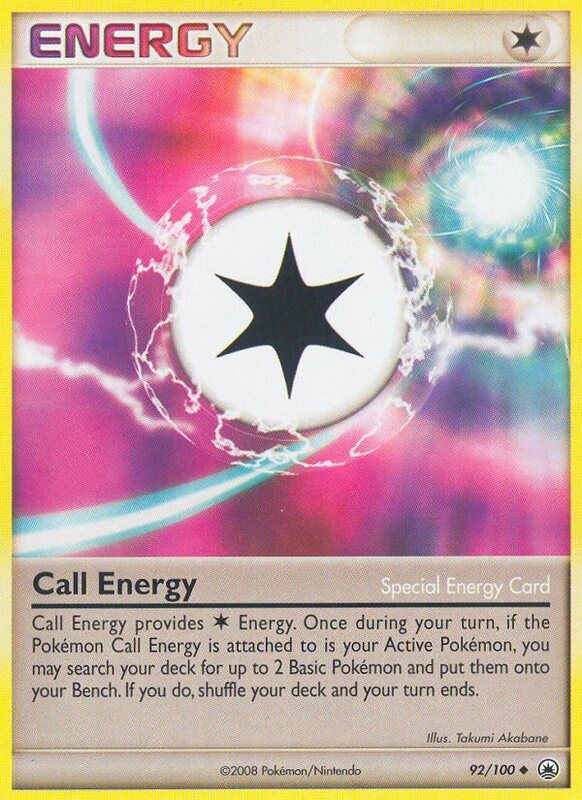 Being able to attach any Energy card allows you to accelerate Strong Energy to your Fighting Pokemon as well, allowing you to power up some strong attacks. One of the nice things about Carbink BREAK is that its fighting typing gives it access to Focus Sash, which could allow it to accelerate multiple times. Additionally, it will most likely have the Safeguard Carbink under it, protecting you from EX attacks while you setup your Fighting attackers. When taking Power Memory into account, Zygarde EX is essentially Lucario EX with a OHKO attack attached to it when it gets up to three Energy cards. 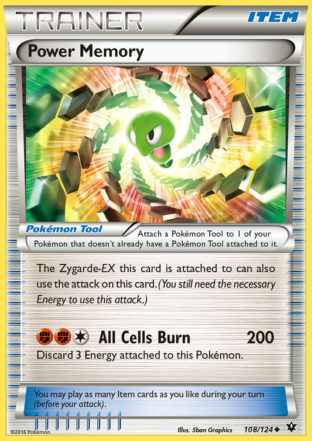 With Strong Energy, Fighting Stadium, and Regirock EX at its disposal, Zygarde EX can get up to some solid damage numbers with its low Energy attacks while having the massive All Cells Burn attack waiting to take out any big threats. I think Carbink BREAK with Zygarde EX is an obvious pairing, and forms somewhat of a Fighting type Virizion EX/Genesect EX style deck. One of the nice things about Zygarde EX opposed to Genesect EX during its prime is that Zygarde EX has more attack options at its disposal allowing you to put up damage early, and not needing turns to get setup. The 190 HP is also very cool to see and should allow Zygarde EX to survive some knockouts that a 180 HP might be knocked out from. 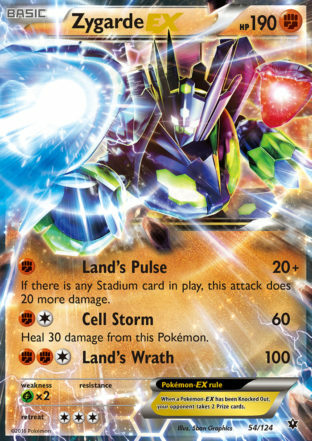 I don’t think Zygarde EX will be that strong in a Night March / Trevenant BREAK dominated format, but I think after rotation, if the cards that make those decks so strong rotate out of format Zygarde EX will instantly become a strong contender. 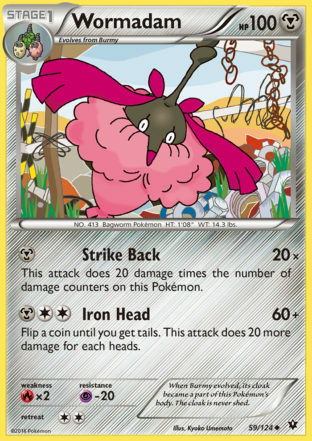 These Mew cards that can copy a Pokemon’s attack in some form always seem to be good, and this one doesn’t look to be any different. It is limited to copying Basic Pokemon this time around, and only your own, but there are plenty of good Basic Pokemon in format and Pokemon will surely print more. One thing Mew does is allow you to use attacks for one less Energy than their normal cost when Dimension Valley is in play. This means you can copy a Joltik’s Night March attack for a single Energy card. This is actually how players used to build Night March decks last season using Mew EX, so we may see a return of this type of the deck. Of course this time around it only gives up one prize. 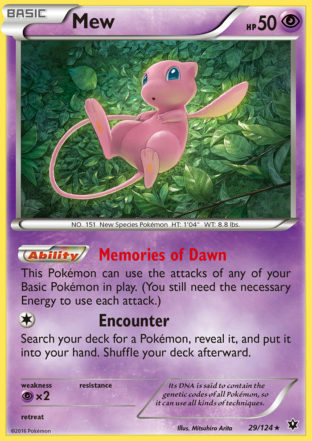 Using Mew in Night March is simply the most obvious option, I am sure there will be tons of great ways to utilize this card throughout its lifespan. 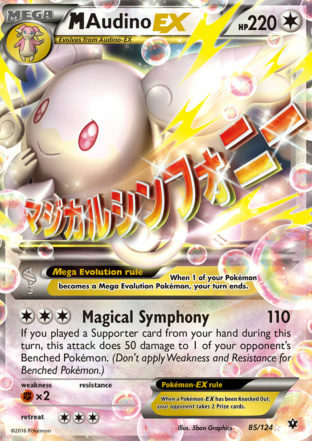 Mew EX found itself used in a variety of roles in its lifespan, and this one players will be less hesitant to throw into decks since it only gives up one prize. For example, a Bronzong deck could use Mew to copy Genesect EX’s attack and take a OHKO with a non-EX which can create some more favorable prize trades for the deck. Finally, the card players are most excited for. One of the worst parts of the standard format is that the disruption cards are generally too weak and don’t allow a player to actually make a comeback if they fall behind in prizes. N should help alleviate this problem, giving players a much more disruptive option than Judge and Ace Trainer, allowing for come from behind play to exist again in the Standard format. This is also my favorite art of the card. Welcome back old friend! And that will conclude the review for Fates Collide. I think this is a set that has a lot of interesting and strong cards, but many of them will have to sit in binders until Night March rotates out of the format. The one obvious game changer is N, which will see lots of play in most decks right away. While I’m thankful that Seismitoad EX and Giratina EX finally have some proper counters in the format, I really wish Pokemon printed a Night March counter in the set as well, especially since they made the deck better by printing Mew. Now with Mew in the fold and no direct counters printed against it Night March appears poised to be the BDIF deck through the remainder of the season.